You say you like the Kindle, but wish it had a color screen? The Sharper Image Literati could be the answer to your prayers, boasting a full color display in a Wi-Fi equipped E-reader that will sell for a not-too-crazy $159. But before you plunk down your credit card, there are a few things to consider. Ask most Kindle or Nook fans, and they'll rave about how much better the E-Ink screen is for reading than a computer-like backlit LCD. Color displays using E-Ink and their competitor Mirasol have been shown, but so far nothing has made it to market. 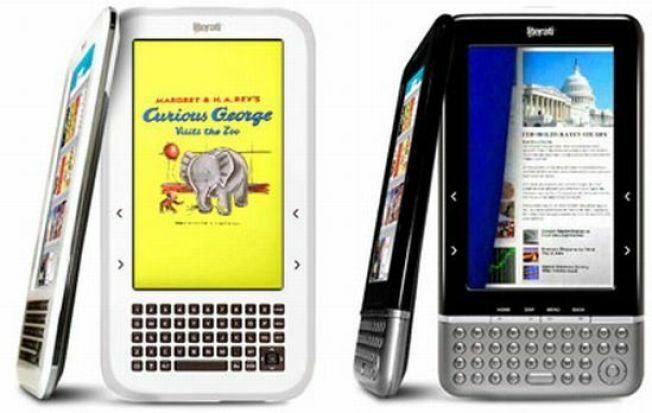 This is why the Literati uses an illuminated 7-inch 400 x 800 LCD display just like a tablet. The difference here is that the Literati doesn't have a touch screen, can't run any apps, and can't access the Web beyond downloading books from the Kobo e-book server. So does that make the Literati nothing more than a low cost tablet without the computer part? The Literati will be available in October from major retailers such as Macy's, Best Buy, Kohl's, JC Penney, and Bed Bath & Beyond.